If you have been googling on what to eat in Barcelona, chances are you’ve probably seen the word tapas pop up every single time. 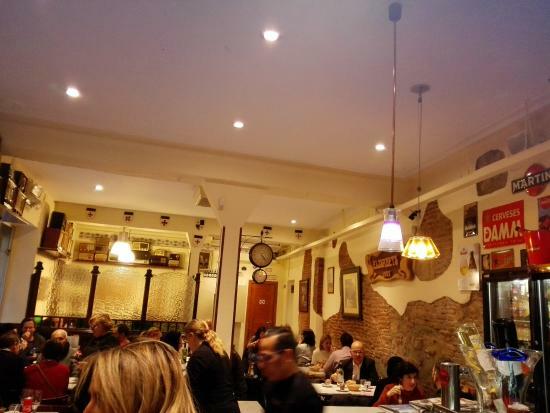 We’re guessing that you already have a good inkling of what tapas is but do you know where exactly to find the best tapas bars in Barcelona? Be it standing bars, market bars or where to get free tapas– we’ve got you covered. Quimet i Quimet is a bustling little tapas bar has only two small tables and no seats. Lined from floor to ceiling with an impressive array of wines and spirits, you’ll be considered lucky if you snag a spot at this highly popular standing-only bar. What to Eat: Choose from an exciting array of Montaditos (tapas on a slice of bread) served with delectable combinations such as salmon with truffled honey and tuna belly with creamy sea urchin. What to Drink: Don’t leave without trying the iconic Quimet i Quimet Belgian beer that has been brewed to perfection. 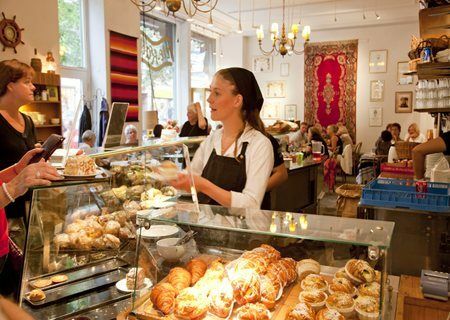 Opening Hours: Noon to 4pm and 7pm to 10.30pm during the weekdays and only from noon to 4pm on Saturdays. Closed in August. 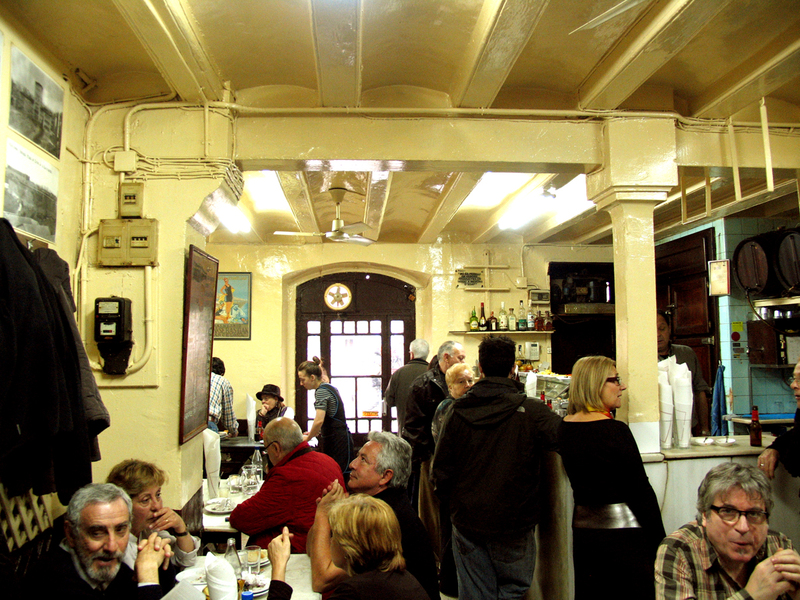 Termed as Barcelona’s beloved gastronomic icon, La Cova Fumada has been around since 1944 serving up classic Catalan favourites. What to Eat: The legendary bombas (pork-filled, crumbed mashed potato balls that are deep fried) served with either mild garlic mayonnaise or a spicier cayenne pepper sauce. Don’t forget to check out the blackboard menu that offers fresh grilled seafood as well. What to Drink: Enjoy a lovely glass of Cava de sangria while munching on these Catalan classics. Opening Hours: 9am-3.20pm on Mondays to Wednesdays, 9am-3.20pm and 6-8.15pm on Thursdays and Friday, 9am-1pm on Saturdays. 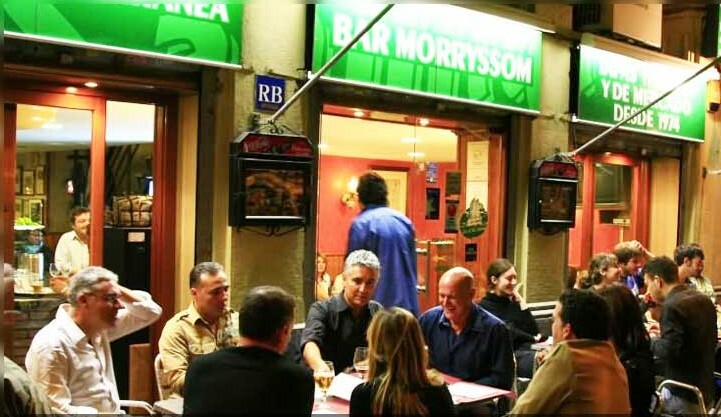 One of the best picks for tapas in the city, Morryssom is a popular lunch spot amongst the locals with pavement tables to allow you to bask under the Mediterranean Sun while sharing tales of your travel escapades. What to Eat: They serve a reliably good range of tapas like gambas rebozadas (lightly-battered prawns) but you have to try their richly seasoned paella with butifarra (spiced Catalan sausage) or goat-cheese vegetarian paella. What to Drink: Keep cool this summer with a refreshing glass of Sangria. Elisabets is a quaint restaurant that is popular for its authentic and generous servings of homemade tapas and sandwiches. Step into this lively and rambunctious place and find yourself lost in conversation with local students about everything under the sun at any time of the day. What to Eat: Try the morcilla amb confitada de cebollas (blood sausage with braised onions), it’s sweeter than it sounds! What to Drink: Without a doubt, a jug of beer! Gata Mala is one of the very few tapas bar in Barcelona that remains true to tradition by serving free tapas with every drink. 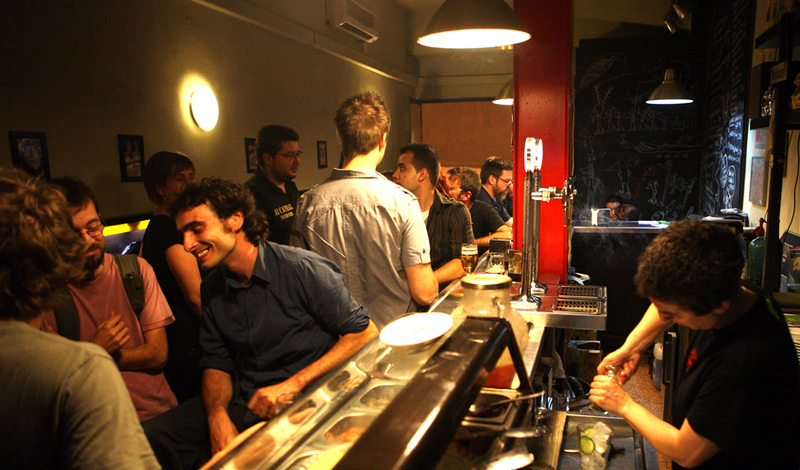 Packed with locals, this no-frills bar is a great place to have a drink and chill with your travelling buddies. What to Eat: For every two beers you order, you’ll be served a generous portion of ensaladilla rusa (mayonnaise potato salad with chicken, eggs and tuna). What to Drink: Feeling adventurous? Try the gin and tonics made with cucumbers and peppers- it’s sure to give you a ‘buzz’. Sworn by tourists and even some locals as the best Tapas bar in all of Barcelona, Bar Pinotxo is a 14-seater bar in the famous La Boqueria. With the ever-so-charming Juanito Bayen, owner and face the bar, serving you up classic tapas dishes, you will surely be in for a treat at this coveted bar. What to Eat: From their classic chickpeas and pine nuts to their famous xuxos, Bar Pinotxo will surely have something you’ll love, both sweet and savoury. What to Drink: Settle down at this well-loved tapas bar with a glass of sangria or cava, if not both. There’s no way you can get into the legendary seafood restaurant without queuing- be prepared to queue for more than 30 minutes. What’s there not to love when there is fresh seafood and friendly service available at Cal Pep? What to Eat: The pièce de résistance of this popular seafood tapas is none other than the stellar Seafood Platter that includes the much raved about deep-fried Calamari. 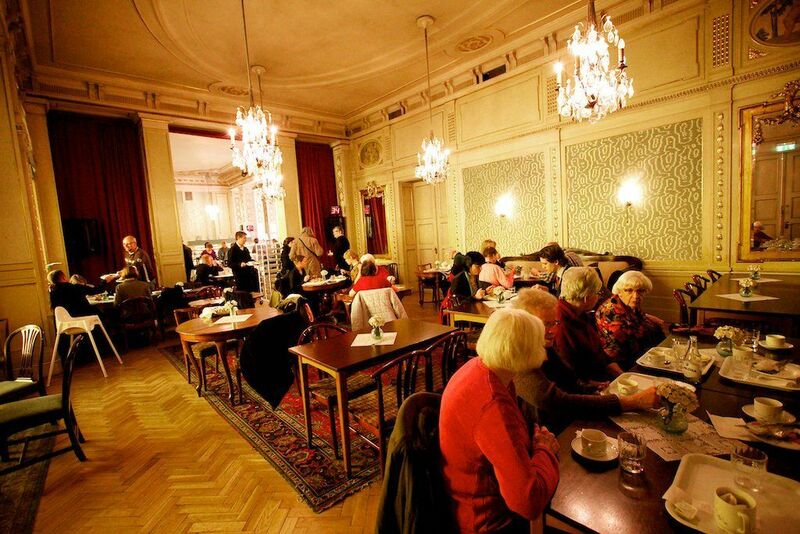 Opening Hours: 7.30pm to 11.30pm on Mondays, 1-3.45pm & 7.30-11.30pm from Tuesdays to Saturdays. Closed on the last 3 weeks of August. Can't get enough of tapas? Join our lovely BonAppetour hosts like Nani for a tapas making class! 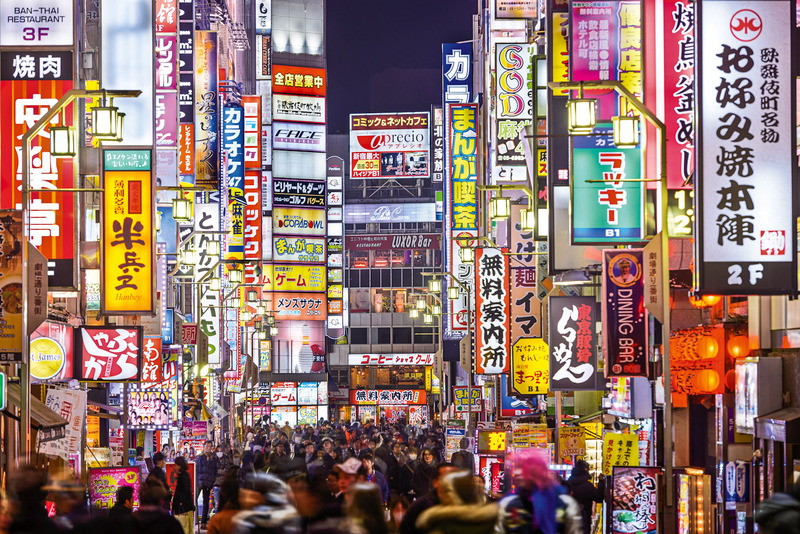 Tokyo, Japan’s capital with its neon-lit streets, is the largest and most populous metropolitan area in the country. A city that prides itself on its ability to constantly change and reinvent itself, Tokyo is one of those cities that will wow you at every turn. With a rich cosmopolitan food scene, one of the most efficient public transport systems in the world and amazingly clean grassy parks, what’s not to love? With the endless number of things that you can do – splurge on sushi at every street corner, witness the cherry blossoms fall gently all around you as if you were in a movie, a hands-on authentic sushi or gyoza making workshop with a local Japanese family, or even savour grilled chicken from lantern-lit yakitori stands. You may be asking yourself, where do you even start? So here is the ultimate guide that will help you navigate your way around Japan. 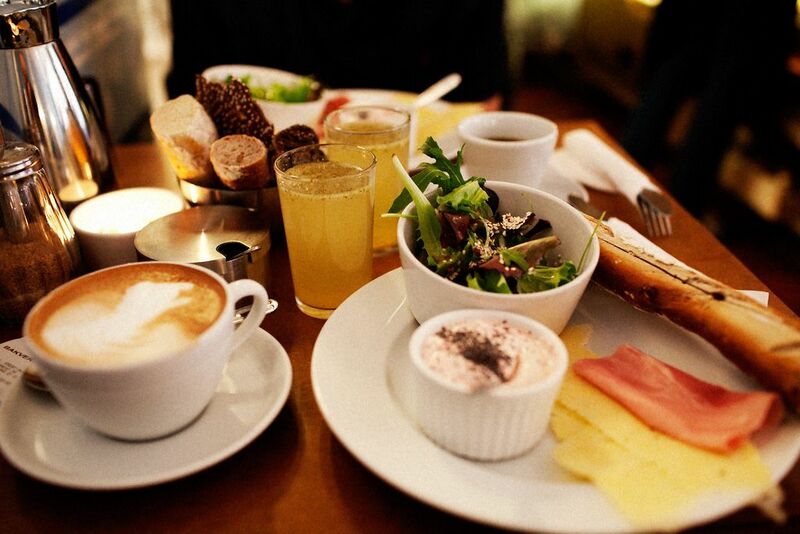 Food, attractions and unique experiences that you must not miss out on can all be found below. The first place that comes to mind for ‘food you have to try in Japan’ would be shabu shabu. Not just any shabu shabu, but the best one from Zakuro. Zakuro serves the finest quality of wagyu beef to cook in your own shabu shabu pot. With just the right mix of atmosphere, amazing service and out of this world food, it is a perfect spot for tourists like yourself to settle down together with your friends and to enjoy some high-quality dining. Why Zakuro? Since there are about a hundred other shabu shabu eateries out there! The differentiating factor would be their special ornate copper nabe (cooking pots) that have been handcrafted and been in use for almost 60 years, exuding a sense of treasured antiquity. Setting the special ornate copper nabe over a stove heated by charcoal produces more heat than gas fire, so as to bring out the flavours in the dash (stock). 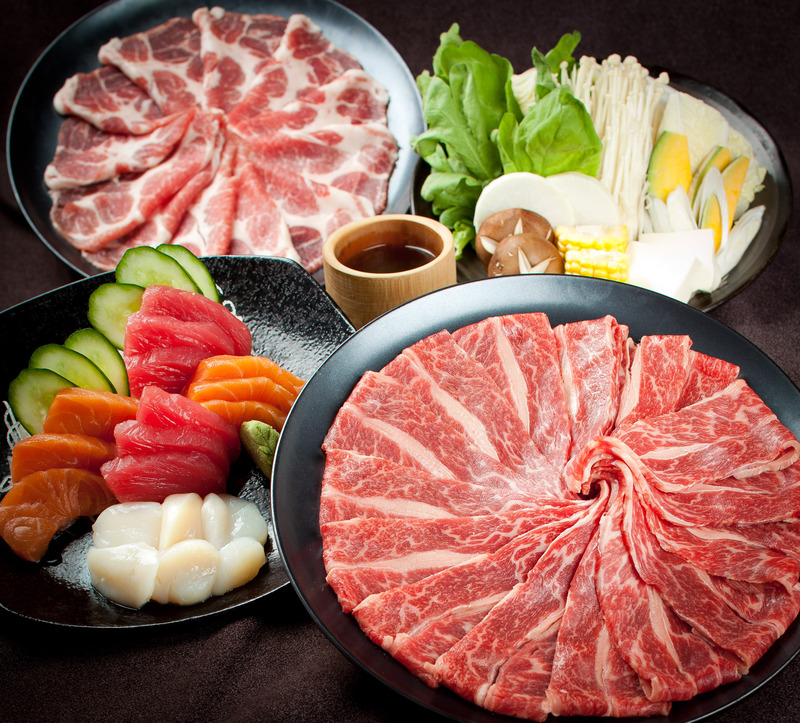 Come and enjoy a shabu shabu meal perfectly accompanied by beautifully marbled wagyu that will arouse your palate with an undeniable mix of aromas and flavours. Entering a japanese restaurant wherever you go, in the section under rice there will always be this dish that says ‘tonkatsu’. 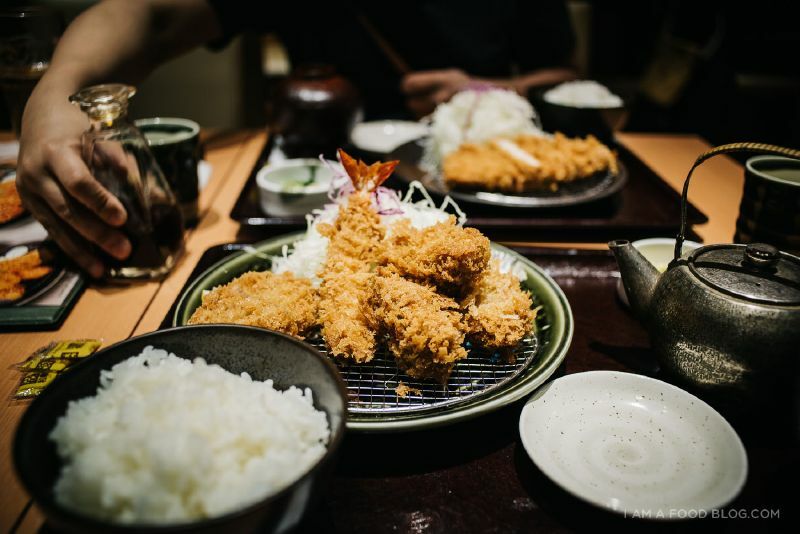 You may or may not have ordered it but know that any tonkatsu you may have tried so far cannot beat this restaurant’s Wako Tonkatsu’s pan-crusted deep fried pork cutlet. 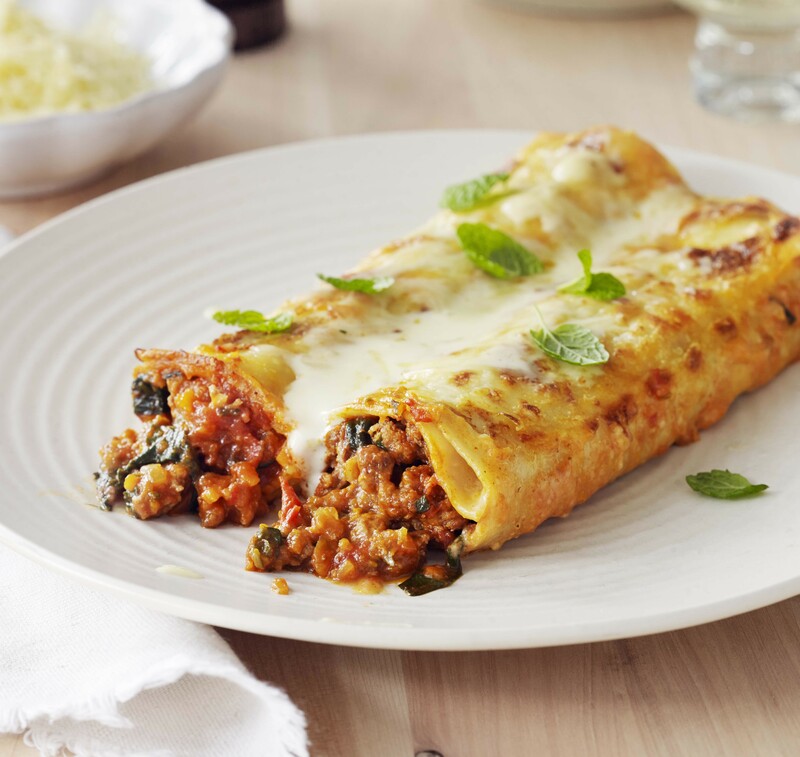 Crispy and crunchy on the outside yet juicy and soft on the inside.. oh so delicious. Usually served with fluffy, soft Japanese white rice with a stack of cabbage on the top, pickles and miso soup. 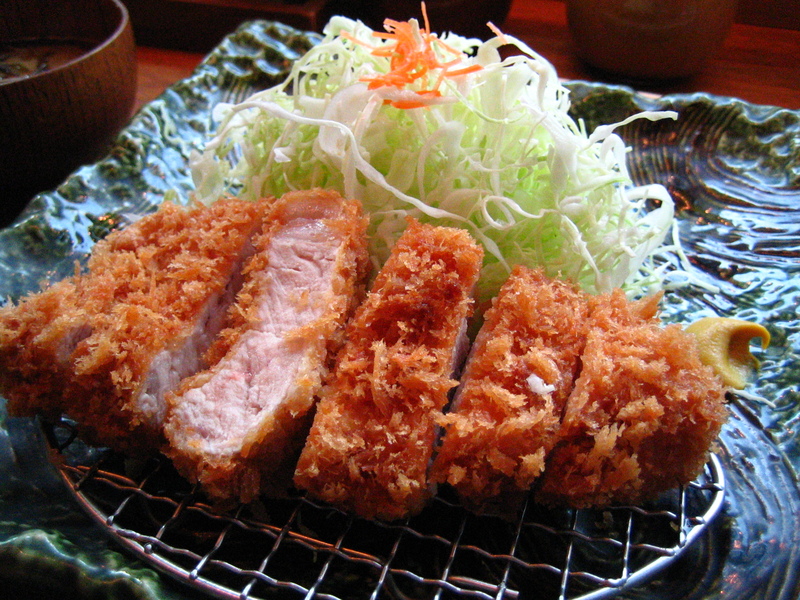 Wake Tonkatsu, due to its wide knowledge and expertise in the field of Tonkatsus, offers you two choices: the Rosu-Katsu (loin) and the hire-katsu (fillet). The loin involves a lot more marbling, hence it’s juicer compared to the fillet. Choose wisely because though they might look vaguely similar, they are all different in taste. If you were looking for one of Tokyo’s hidden gems, Momose is one of them. Only known to locals, with rarely any tourists crowding the area, there are long lines meandering outside of the restaurant at all times of the day. 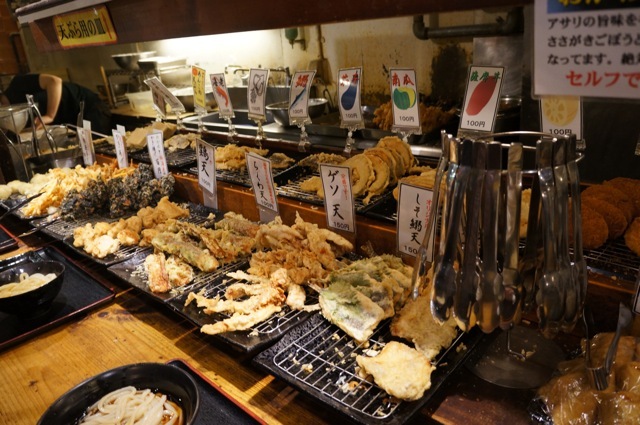 Momose is an old tempura restaurant that serves the best tempuras in town. The tempuras are crispy and delicious. 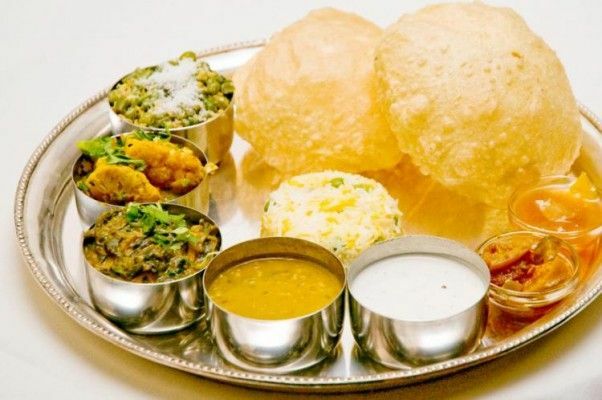 You do not only get tempuras at this restaurant, there are a myriad of other dishes to choose from. Catch a seat at the bar where you will be able to see the sushi chef slice finely into a slab of tuna and putting together the ultimate flavourful sushi. A franchise restaurant that is popular both in Tokyo and LA. With over a hundred different ramen stalls selling similar types of ramen, Tsujita sets itself apart by creating their own specialty called the tsukemen, otherwise known as the dipping ramen. The noodles of the Tsukemen are thick, soft to bite into and are served with dipping hot broth full of flavour, and bits of pork to provide that extra crunch. 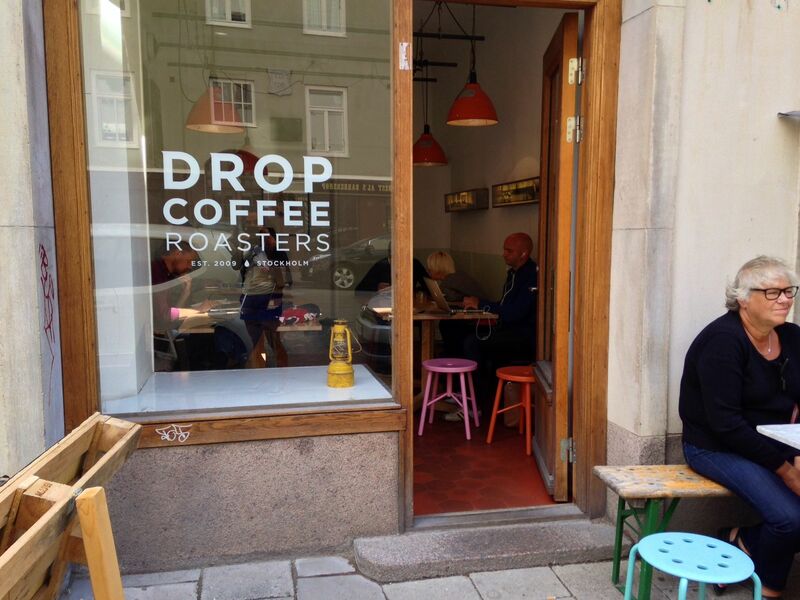 Go and check out what their little shop has to offer. 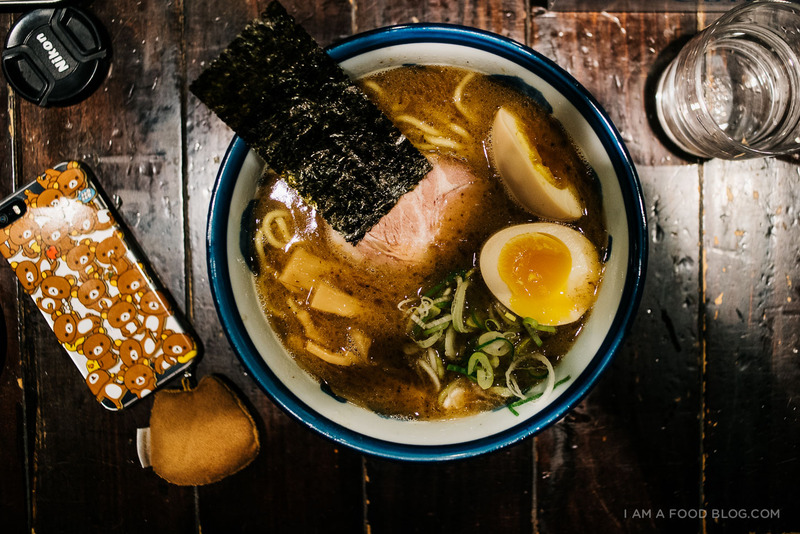 Definitely a ramen experience not to be missed. This sanuki udon joint, is run by Kazutoshi Tao who is the chief of an udon club and a gourmet columnist. The udon that you will devour at this joint is handmade by noodle experts from Kagawa. Like many other udon joints in the city, it is an unassuming spot for anyone who wants to eat udon in Japan. You walk up to the counter, order your noodles, then pick your toppings and make your payment. Fast and efficient. An added extra incentive to come to this restaurant is that there are DIY beer pouring machines where you can drink until your heart’s content! Want to make your trip more worthwhile? 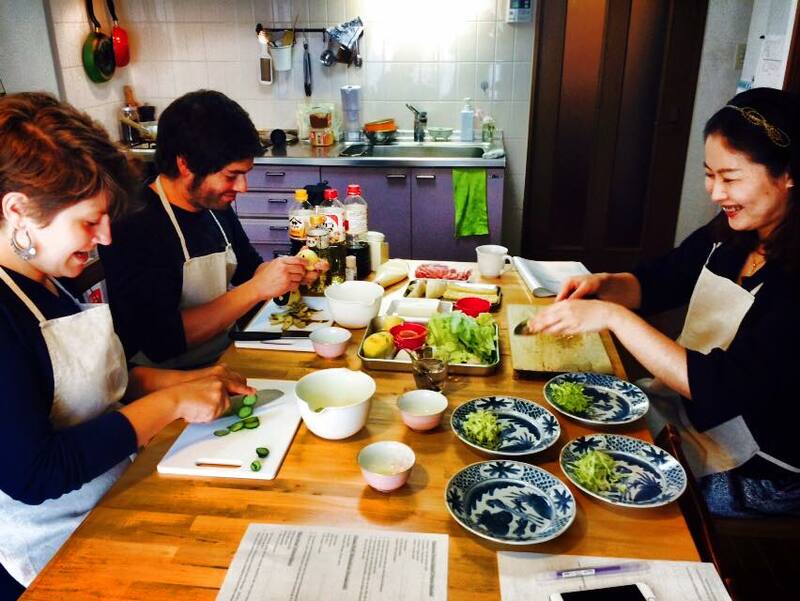 Try dining with a Local in their home where they will cook up delicious Japanese delicacies! 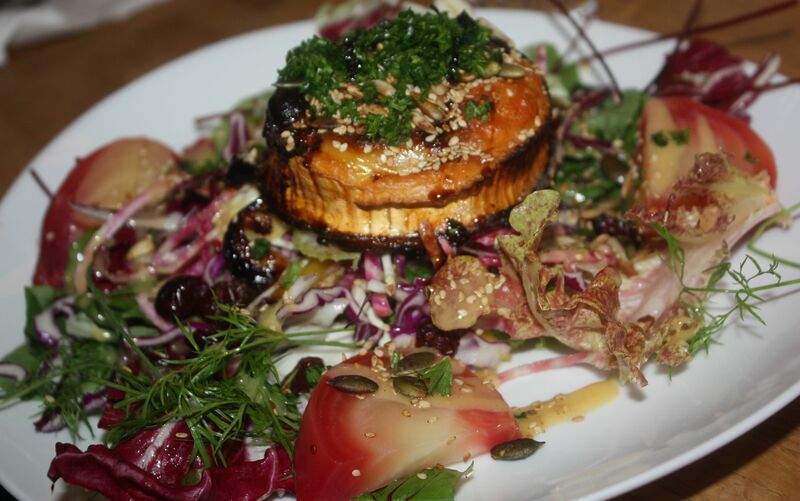 Join our home chef Mayuko in her little kitchen to cook up a beautiful feast. The completion of the Meji Shrine in 1920 was dedicated to the deified spirits of the 19th-century Emperor Meiji (first emperor of modern Japan) and Empress Shoken. Emperor Meiji was born in 1852 and ascended to the throne in 1867 at the peak of the Meiji Restoration when Japan’s feudal era came to an end and the Emperor was restored to power. The Edo Period was a dark time in Japan’s history where Tokugawa Leyasu gained control of Japan and ruled unfairly, helping the rich like himself and making the poor much worse off. The shrine was destroyed during the Second World War, eight years after the passing of the Emperor Meiji, but was rebuilt shortly after that. The serene yet austere atmosphere of the shrine offers spacious walking paths for you to take a relaxing stroll around the park. 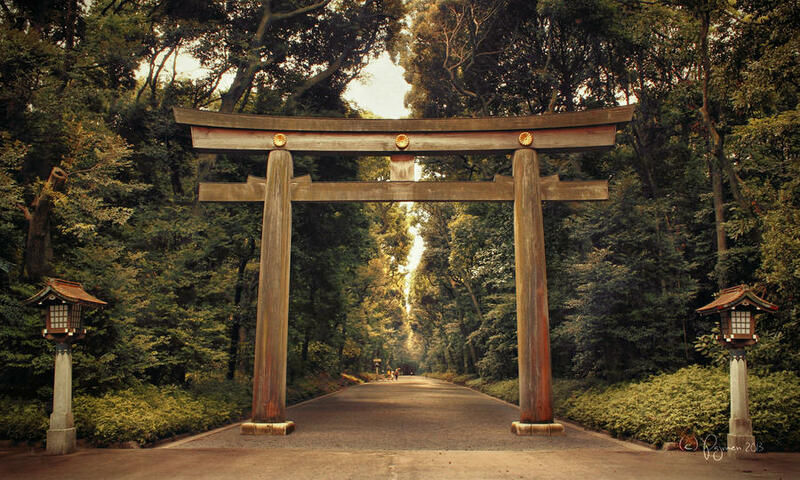 A 40-foot-high torii stands tall at the entrance of the 200-acre park, lined with thousands of cypresses, and offers a hideout from the urban and bustling Tokyo. At the Meji Shrine, there is a communal water tank where you will be able to submerge your hands and mouth to purify them before offering up a prayer to the gods. Writing your wishes on little pieces of paper and tying them onto the prayer wall or tossing some yen into the offering box are some of the local activities that you can take part in. Whilst doing this, bow your head twice, clap twice and bow once more. This is a typical Shinto (indigenous faith of the Japanese people) activity. Open from sunrise to sunset, you must seize this chance to immerse yourself in some local practices and history. 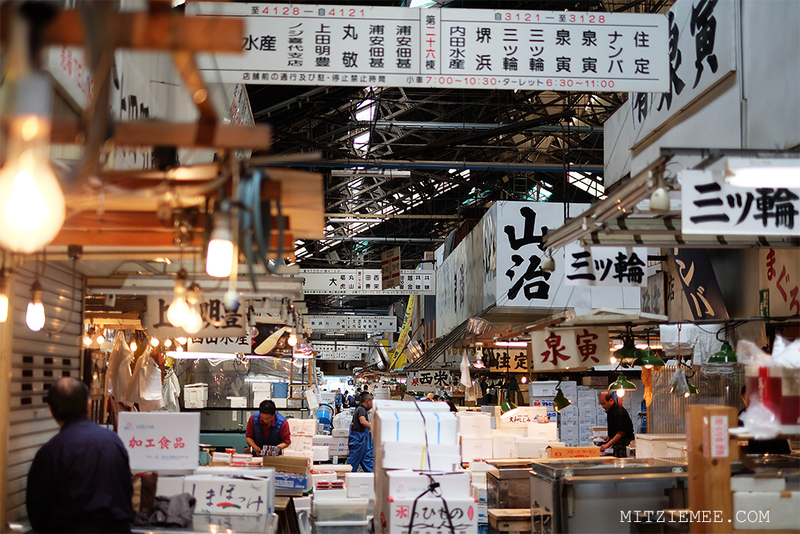 The name Tsukiji Fish market should not sound foreign to you, for it is the world’s largest, busiest, and stink-free fish market. Seeing rows and rows of fresh fish and other seafood and the bustling atmosphere of scooters, trucks, sellers, and tourists moving around the market has attracted many tourists from around the world. 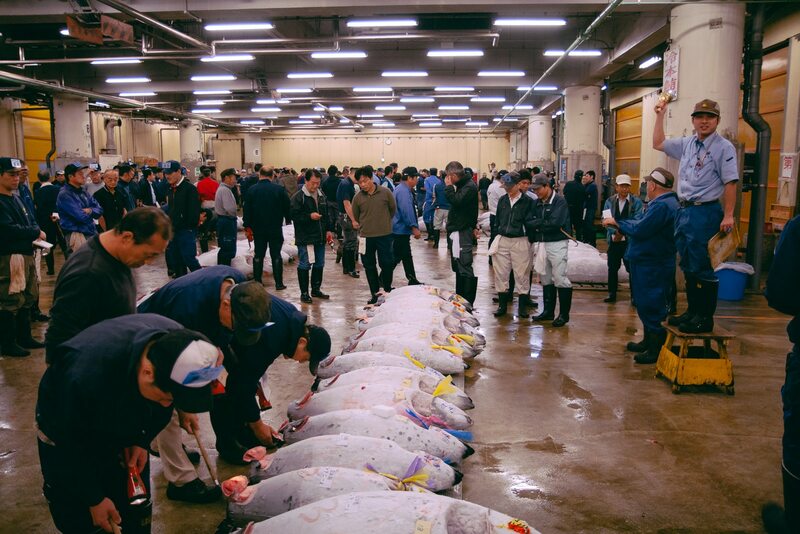 Handling over 2,000 tons of marine products per day, it is a favourite destination for tourists to come at 5 a.m. to witness the live tuna auctions. Tip: Before you go to the market check the website if the auction will be open to the public that day and then apply at the Osaka Fukyu Center (fish information center) at the Kachidoki gate, on a first come first basis of only 120 people every morning. Registration starts at 4.30 a.m.
As Tsukiji Fish market is one of the largest in the world, you would need to know how to navigate yourself around it. There are several off limits areas to the public as well as an inner and outer market where different activities occur. The inner market is where raw ingredients can be found and bought whereas the outer market has sushi, cooked food etc for you to indulge in. To ensure that daily routine of these Japanese people runs smoothly, you should strictly follow the map and stay on the course meant for tourists, and not venture off. If you follow these rules, there shouldn’t be a problem and your time at the Tsukiji Market should be a breeze and an eye-opener. Due to the number of tourists that visit the Tsukiji market, authorities are concerned that the current infrastructure will not be able to accommodate the growing number of people visiting every year. Therefore the market is scheduled to move to a new location in Toyosu in November 2016. During the Edo Period (1603 – 1867), the Shinjuku Gyoen was built to serve as Tokugawa Leyasu’s residence, the Emperor at the time. Afterwards, during the Meiji restoration period, the Shinjuku Gyoen was converted into a garden for recreational and entertainment for guests. Similar to the Meiji Shrine, it was destroyed during the war and rebuilt later in 1949 as a public park. 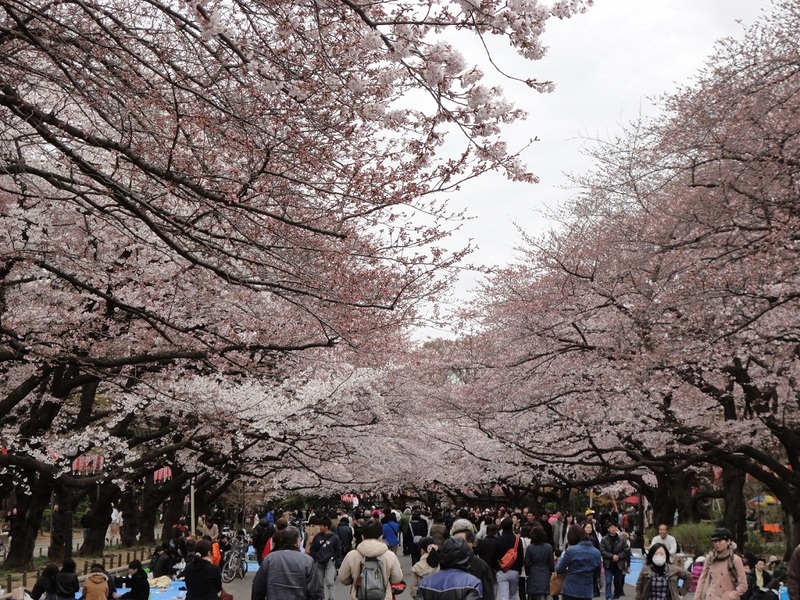 Since then many locals and tourists fill the park, especially during the cherry blossom period. A tranquil garden that will appeal to all of you who seek to escape the busy and urban city centre. 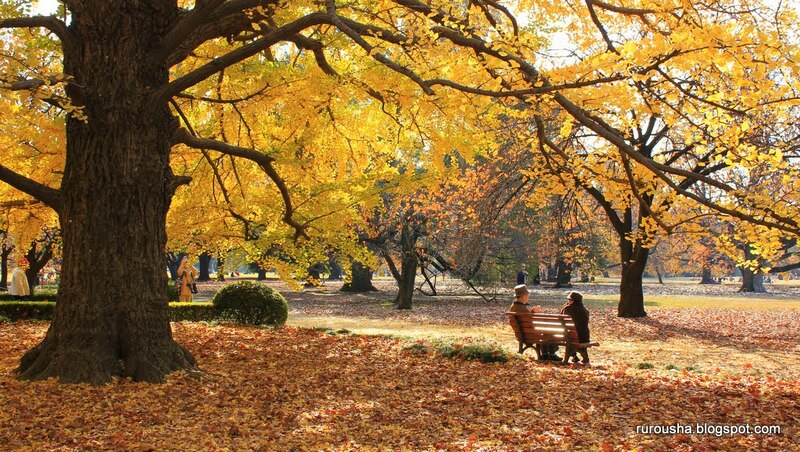 Shinjuku Gyeon National garden is one of Tokyo’s largest and most popular parks. Because it is so huge, it is split into 3 gardens – The Japanese, English, and French Garden. The first of the three, The Japanese Garden, is the oldest and most traditional. It features large ponds dotted with large koi fishes and lined with well-manicured bushes all around. Several pavilions can be found around the garden where you can take a short rest from walking around the park. The first two weeks of every November, there is a chrysanthemum exhibition where you can view the beautiful arrangement of flowers and also buy a few seedlings if you wish to go home and nurture them. Lastly, The French Garden features a rose garden and beautiful meandering paths where you can take a leisurely stroll. Walking through the garden, the branches of the beautiful trees will hang above you. Watch as the sun rays try to break through the leaves. A beautiful sight! Ueno Onshi is another park that you have to visit, as it is one of the first parks in Japan that was designated as a public park. A feature that makes Ueno Onshi Park one of the must-see parks of Tokyo, is the Kaneiji temple. It is one of the city’s largest and wealthiest temples, which was the home of the Tokugawa clan during the Edo period. He lead the country into political stability and economic growth under shogunate (military dictatorship). The beautiful cherry blossoms that fill the park have also become one of Japan’s ‘Must-sees’. Kaneiji temple, similar to the other 2 attractions mentioned, was destroyed during the world war two but later rebuilt and designed similar to a western-style park in 1873. Other features include several famous and well known museums such as the Tokyo National Museum, National Museum for Western Art and even Japan’s first zoological garden. 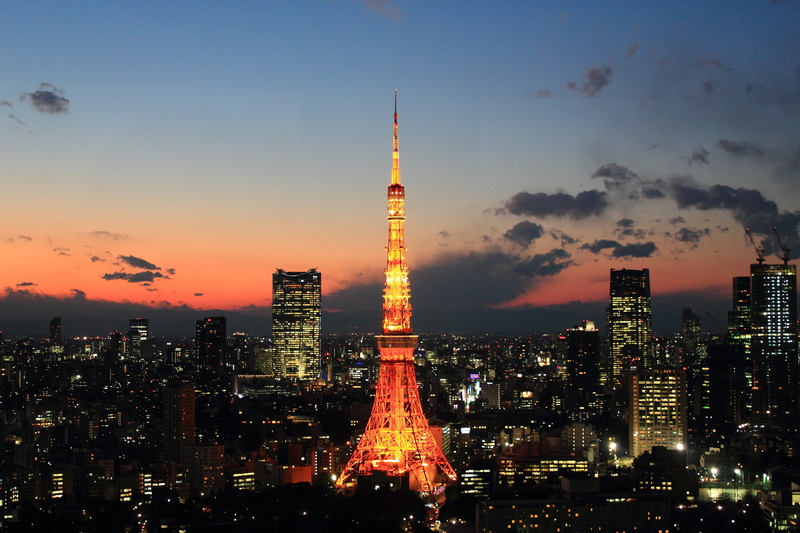 The Tokyo tower opened in 1958 and since then served as both a telecommunications tower and a tourist attraction. Its design and architecture was inspired by the Eiffel Tower, just smaller and painted in red and white. The tower is over 333 metres tall and a good place to enjoy a 360-degree view of Tokyo. This particular attraction is one that the Japanese people hold very close to their hearts. Not only because it is a vital landmark in Tokyo’s skyline, but also because it played a very important role in Japan’s growth. This structure acts as a tribute to all the hard work of Japanese ancestors and the people today, that contributed to Japan’s rapid industrialisation as well as economic growth. Today, despite being one of Tokyo’s oldest transmitter, it is the most distinguished throughout the Kanto region. Transmiting radio, digital radio and digital television. These capsule hotels were originally designed for men only, as there was a reasonable amount of risk for women staying in such places. However there are several capsule hotels all round Japan that offer ‘men only’ and ‘women only’ sections. Though its original purpose was meant as such, there is no sign saying you can’t try it out for a night. All you need is a keen sense of adventure and a leap of faith from the usual comforts of the hotel room with room service and your individual toilets. Wherever you come from, you would definitely have a national sport. Baseball for America, Rugby Union for New Zealand, Golf for Scotland, and for Japan, Sumo Wrestling. Sumo wrestling is a competitive full-contact sport where wrestlers attempt to force their competitor our of the circular ring, or touching the ground with anything other than the soles of their feet. 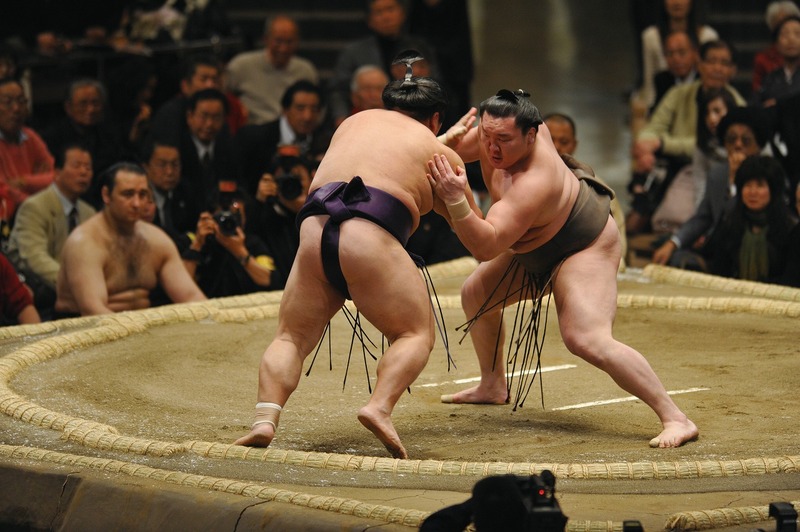 The men who usually take part in Sumo Wrestling weigh more than 330 pounds (about 145 Kg). Becoming a professional sumo wrestler is very demanding and nothing like a vacation at all. Training begins at five in the morning and continues until the afternoon with few breaks. Their training includes them whamming their bodies into an opponents body and slamming against wooden planks. The saying blood, sweat, and tears really describes their life to a tee. If you happen to be in Tokyo during one of the three grand tournaments that take place in January, May and September, then this is an eye-opening experience to definitely indulge in! 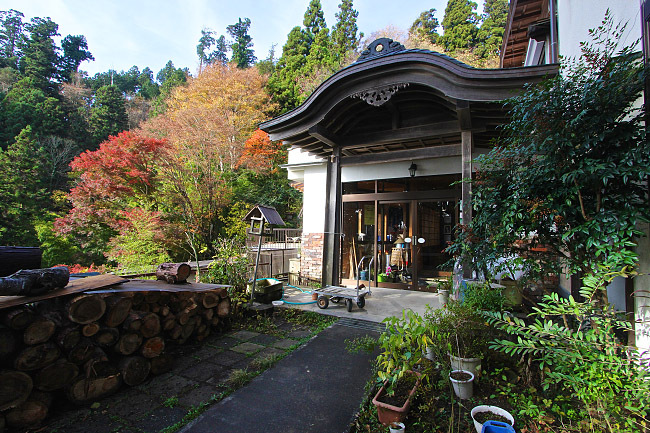 Shukubo Komadori-sanso is a mountain lodge that is centuries old. Getting there may be a challenge, but as they say ‘nothing good comes easy’. From the city centre, it involves a 3 hour journey to the lodge. Two trains, a bus, a cable car and a 15 minute walk is all you need to finally reach the lodge. Every minute spent travelling there would be worth the time (trust us! ), from beautiful panoramic forest views to relaxing in the mountains with a natural waterfall massaging your back. Something off-the-beaten path for you to experience. 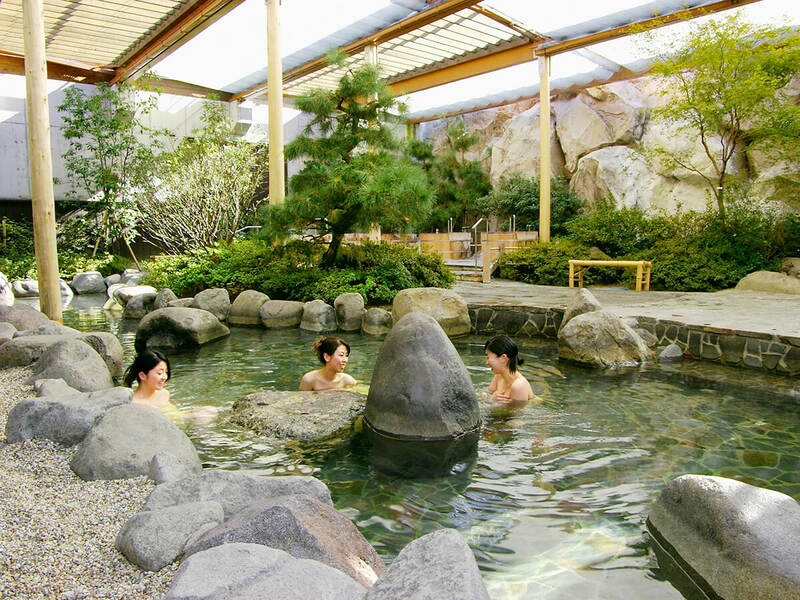 Who does hot springs better than Japan? Anyone who has been to Japan and tried their onsen will agree with me without any hesitation. Ode Onsen Monogatari offers both open air and private onsens served together with traditional Japanese food. Housing over 6 different baths, including those you can lie down in a tub with lukewarm water for summer. The water is drawn from 1,400 metres underground and the thermal baths are believed to be able to relieve your nerves, muscle and joint pain. If you are really looking for a off-the-beaten path experience that gives you an insight into local life, this is one to try. 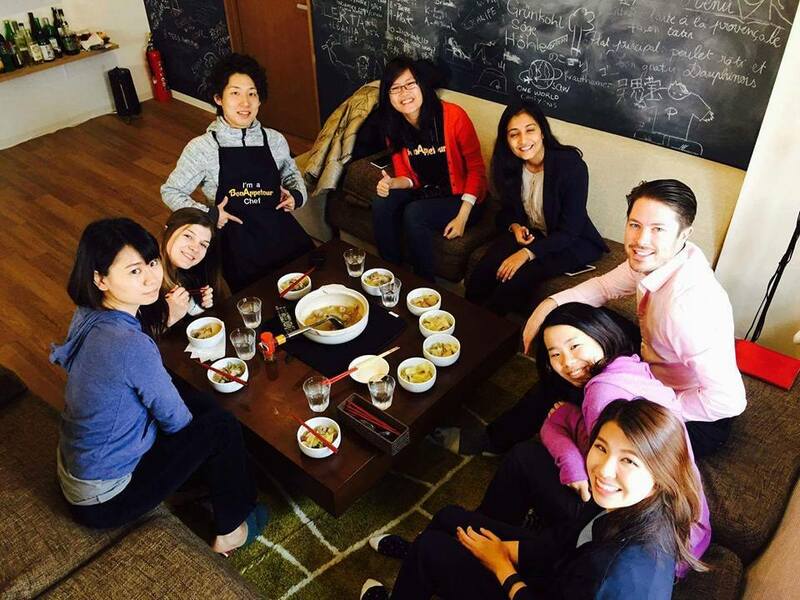 Organised by BonAppetour, you will be given the opportunity to go to a local’s home and dine at their place, eating lovely home cooked food, sharing stories about Japan, introducing must-eat restaurants and many more. The possibilities are endless! Head over now, to subscribe as well as sign up and book the next meal that you are going to have with your hosts.